I made some vocabulary cards over the summer to go with the Everyday Math units. These picture cards tie into the vocabulary for grades 3, 4, and 5, as I’m often looping with my ELL classes within those grade levels. I put the cards into a Word document, so the pictures can be resized. This has been very useful as I have been able to make the images pretty small, to fit on a page of notes for our interactive math notebooks. Some things you won’t want to miss! This may be just the ticket to convince the hubs to finally buy me a new printer! I wish we used Everyday Math. We use Math Expressions. 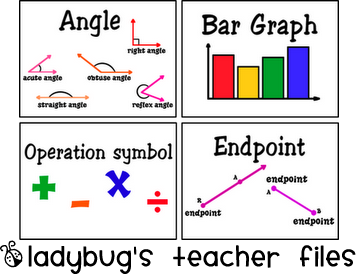 I student taught (five years ago..hehe) with a teacher who used Everyday Math and I loved it! These posters are FANTASTIC! Thank-you so much. WOW, WOW, and WOW! I would so have paid for these. Thank you so much!!!!!! Thank you so much for sharing your work! These are a fantastic resource!! Thanks for sharing! I love this. I am teaching a 6-8th grade remedial math class, so I would love to add some terms. Could you point me in the right direction for the font and graphics? Of course, I will send you anything I create to add to your collection. How do I download the Vocabulary Cards?? I can't WAIT TO use them 🙂 I teach 5th grade! Hi Mrs. Gauster–you will need a free Google Docs account to see them. Please let me know if you aren't able to access them! These are awesome! I hope you share them sometime on Math Monday Blog Hop! How kind of you to share these AWESOME resources! Hats off to you, and THANKYOU for all of your hard work! I am so impressed with these! I teach 2nd ESL/bilingual. Some of these are grade appropriate but I'd like to create some to match your cards. How did you "draw" your graphics? It'd be nice to keep them consistent as opposed to using funky clip art. Thanks! Thanks guys! Cindy, I did share them awhile back on the blog hop (which I love!!!). Señora Stanton, I used a program called Fireworks to make mine, thanks! I just found these math vocabulary cards and they are awesome!! Wow! These are so great! And what a time-saver. Thank you so much for sharing YOUR time and talent. Thanks for the lovely words–so glad they can be used!! I have a Google account, but for some reason I can't access your math cards and would love them! What should I do? Jenn, did you try a few different letters? They should work ok since you have a Google account. I will look more into this! I also have a google account and can only access the letter "a" cards. Thank you so much for sharing these! They are great! Thank you!!!!! they are awesome!! I'm gonna need more wall space! These are so wonderful. Thanks! Thank you so much. They are beautiful. You really put a lot of work into these! Thank you! This is fabulous! I appreciate all the work… I'm already planning by bulletin boards. Thanks so much for sharing these. I am trying out a different way to teach math and these will definately help with the vocab part of my math journals. I love your blog btw and have been spending "too much" time here…at least this is what my husband says. Thanks again. I am currently teaching third grade for the first time after teaching kinder for 7 years. I would love a copy of these vocabulary cards but every time I open a letter nothing downloads. I am not sure if I am doing something wrong or what. Is there any way you can email them to me? My email is akaaragon@yahoo.com . Thank you so very much!! Thank you a million times over for creating these vocab cards and for allowing us to resize and print them. I am so excited about my new word wall! Honestly and truly, thank you for your time!! OMG- thank you so much for sharing these. I am using interactive math notebooks this year and these are fabulous. You are so kind to share your work. By the way- you do quality work. I wish I had your talent. Wow! Thank you so much for these! I love it! Thank you so much! I just shared your math vocabulary cards with my colleagues. You saved me a lot of time!!! THank you so much for posting these. I am new to fifth grade this year after teaching fourth for years and this saved me so much time while getting used to the new curriculum. So grateful! These are wonderfully put together. Thank you. Any tips for creating my own set? Unfortunately I can't use these since I teach in Spanish. Did you use any special graphics or just make them yourself? Great work..cards are looking gorgeous…keep it up…!!! These look wonderful. Unfortunately, I don't have Word so I can't open them. Do you offer anything as PDF files?